New York-based trumpeter/flugelhornist and composer Brian Groder is still relatively little-known, though he’s been a fixture in East Coast jazz communities since the 1980s. He made something of a splash on the creative music scene several years ago in collaborative recordings with pianist Burton Greene and reedist Sam Rivers, releasing Groder + Greene and Torque, respectively, on his own Latham imprint. Groder doesn’t necessarily need such undeniably heavy company to make his own stamp, however, and is able to hold his own in the front line as a brass player, bandleader and composer. On R Train on the D Line, the second disc with his working trio of bassist Michael Bisio and percussionist Jay Rosen, they make few late-night detours that supplely engage varied moods on eight original tunes. 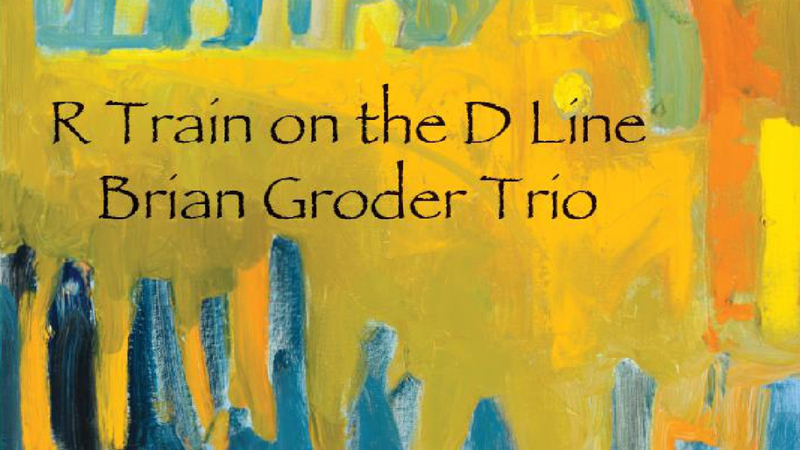 While no second horn is present, the trio’s sound is far from thin — Groder has a fat, steely and crackling tone and his phrasing is witty, clear and inventive. Abetted by the pliant mass of Bisio’s contrabass and the dry, accented hurtle of Rosen’s drums and gongs, the three cut a crisp, formidable arc. There’s a glassy precision to the opening “Quanta,” a clarion and sardonic whine to Groder’s horn as he doles out condensed runs atop chugging, taut stomps and clacking tempo sections, interspersed with bright gong accents and the constant, robust frame of Bisio’s bass. Pizzicato flywheels match the leaps from Groder’s horn, culminating in the lengthy unaccompanied arco grind that acts as a frontispiece to “Retooled Logic,” where Bisio makes extensive use of ponticello harmonics. The three expand and contract amid matched flurries and make economical, spry music that occasionally veers into like hues – while not exactly a suite, there are snatches of commonality between these vignettes, in the hum of comparable actions or lines that pick up where a previous trace left off. Even as they coil and uncoil these narrow treads, it’s difficult not to marvel at the clarity of Groder’s “classic” tone and natural pacing, laconic incisions that are reminiscent of someone like Paul Smoker. Deft bowing and gentle, snappy brush-and-cymbal work open “Praxis,” a dry and airy dance for three that alternately gnaws and twirls as the trumpeter launches into a burred and swinging solo. Exhibiting a rangy calm yet continually smoldering with activity, R Train on the D Line is as fine an example of trio communication as I’ve encountered in recent memory.